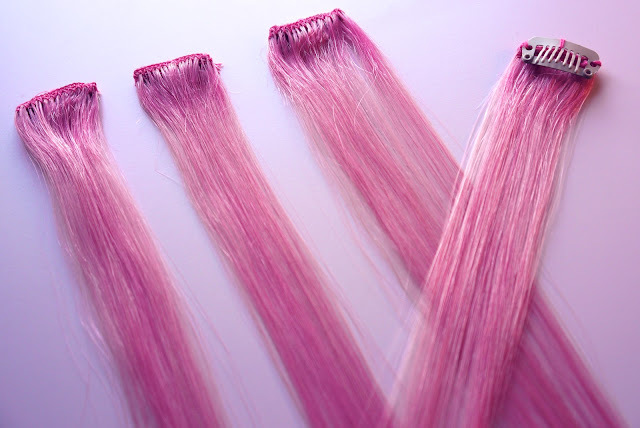 Below are the clip-in accent extensions from Rebelle in the shade "Rose"
I Love you hair color if I went to salon what kind of color is that?? so that I can tell them to color it like your hair?? Your ponytail is so gorgeous! i love the pink in your hair! 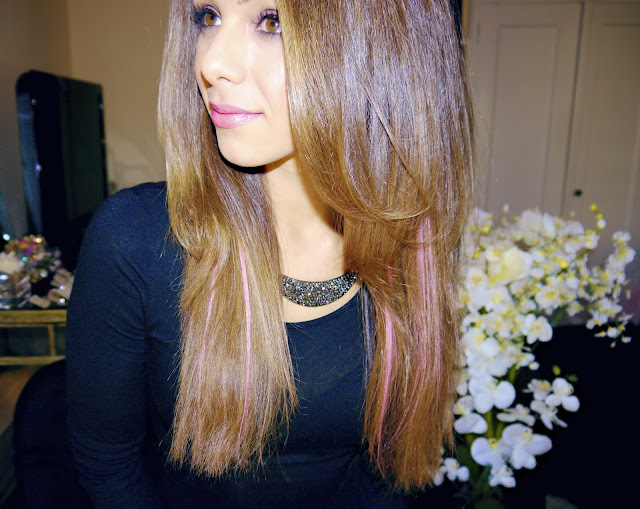 I've used pink hair chalk in my hair from Ulta before but clip in's look fabulous! especially the next day when you gotta work and don't have time to wash the color out of your hair. Annie, I just heard a crazy tip about drinking green tea. My mom is a dental assistant and she told me that multiple dentists have told her that green tea stains your teeth way worse than coffee does! Please drink a straw with your green tea, I don't want to see your beautiful pearly whites get tainted. Lots of love from Fla! i have been looking for a top like that for so long!! where is that from? where is your backless shirt from?!?!? Love your hair! You are beautyful as always. For me it is too carnival-like, but I think it could be fun to try out for new year's eve or a special event. ANNIE YOU LOOK LIKE THE CURRENT MISS USA - OLIVIA!!!! Have you noticed??? I saw her on the miss universe pageant, and thought: "Wow, she's actually VERYYY pretty" - then I thought: "she looks like someone.....ANNIE!!!" well now she's MISS UNIVERSE 2012, you look so much like her - stunning! Absolutely beautiful person inside and out with Beautiful energy and spirit! Love it! Your blog and videos are sooo inspirational, so many great ideas! please the tutorial of this makeup! loved it! hugs from brazil! I totally love it ! I saw a blonde with turquoise clips this summer it was amazing too. But its amazing on you gorgeous! Hey Beautiful Annie !! You always look the best !! Love your top looking for that for so long!! where is that from ?